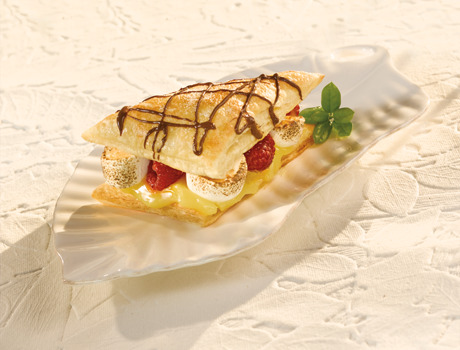 This exquisite dessert features chocolate drizzled puff pastry triangles, filled with lemon curd, fresh raspberries and melted marshmallows. Heat the oven to 375°F. Lightly grease or line a baking sheet with parchment paper. Stir the egg and water in a small bowl with a fork. Unfold the pastry sheet on a lightly floured surface. Brush the pastry with the egg mixture and sprinkle with the sugar. Cut the pastry in half. Cut 1 pastry half into 6 triangle-shaped pieces and place them on the prepared baking sheet. Repeat with the remaining pastry half, making 12 triangles in all. Bake the pastries for 20 minutes or until they're golden brown. Remove the pastries from the baking sheet and cool them on wire racks. Place 6 pastries on a work surface. 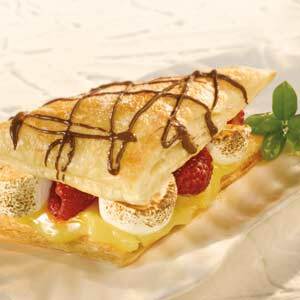 Spread each pastry with about 1 tablespoon lemon curd, 1/4 cup raspberries and 4 of the marshmallow pieces, cut-side up. Place the pastries on a baking sheet. Heat the broiler. Broil the pastries 4 inches from the heat for about 2 minutes or until the marshmallows are golden. Top with remaining pastry triangles. Place the chocolate in a small microwave-safe bowl. Microwave on HIGH for 30 to 45 seconds or until the chocolate melts, stirring after 15 seconds. Drizzle the chocolate evenly over the pastries and serve immediately.